When it comes to improving your swing with irons and hybrids, you have a useful training tool at the ready: your golf bag. At the range, stand your bag up and address a ball with your backside pressed against the bag. Take the club to the top while keeping your right cheek touching the bag. As you swing down and through impact, smoothly transfer contact from your right cheek to your left. Try to feel as though you're rotating around your spine instead of moving laterally toward the target. By remaining in contact with the bag, you'll maintain your body angles longer on the downswing and have an easier time releasing the club and making solid contact. 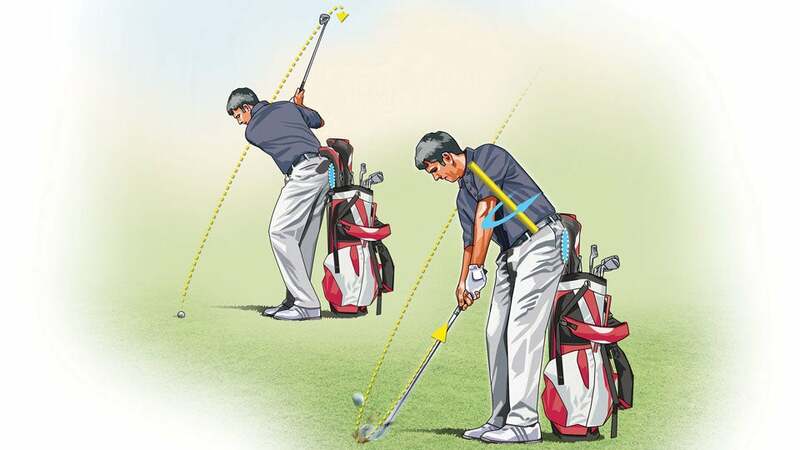 You'll also train the pelvis to stay back instead of thrusting forward toward the ball—a common downswing fault known as early extension that leads to weak shots to the right. Think "cheek to cheek"— your ballstriking and accuracy will thank you for it. Keeping your backside in contact with the bag throughout the swing—first with your right cheek, then with your left—lets you maintain critical body angles farther into the swing for more accuracy and consistency.